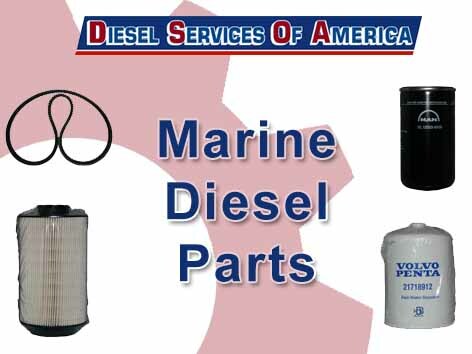 Diesel Services of America specializes in marine diesel engines. They are South Florida’s leading vendor of marine diesel parts and maintenance. DSOA is the one stop shop for everything you need to get your vessel’s engine sea ready. With our team of highly trained sales representatives and technicians, you will always have the help and guidance to find everything that you need. We are factory authorized to service MAN, John Deere, and Volvo Penta diesel engines. We are proud to be the ones that true South Florida natives trust with their seafaring vessels as we have been for years! These parts are built and certified to work perfectly with your units. This ensures that you do not encounter any complications due to shoddy third party parts. We sell parts and accessories such as oil and fuel filter, belts, and engine additives so you never have to go without exactly what you need. DSOA knows that it is stressful when something goes wrong with your boat. We keep our most popular replacement parts, found here, in stock and available for immediate in-store pickup or delivery. If you have an older model diesel engine, our hard to find and obsolete marine diesel parts store is perfect for your needs. We have parts spanning all aspects of your diesel engine and a myriad of manufacturers to choose from. DSOA’s hard to find and obsolete parts store will come through with just what you need when others can’t. Just go to our hard to find parts finder and search the product using the manufacturer and a keyword. Not only does Diesel Services of America supply replacement marine diesel parts to you, but we also have a team of highly experienced technicians to help you repair and maintenance your diesel engine. If a sudden catastrophe does occur our technicians are on call! Equipped with years of knowledge, the highest grade equipment in the industry, and our extensive reserve of in-stock parts, they are the best possible answer to any marine diesel problem or question. While we will always be there to repair your diesel engine, we always hope to prevent these problems from arising in the first place. We can help you create a custom maintenance plan for your engine to keep everything running smoothly. Routine maintenance will give you peace of mind and save you money in the long run. We have a fleet of fully equipped dock-side vehicles that will come to you! This will save you time and take the hassle out of diesel engine upkeep. All you have to do is enjoy your vessel! Here at Diesel Services of America, we pride ourselves on being there with exactly what you need. Whether that is genuine OE marine diesel part, an obsolete part or an experienced technician DSOA is there to help. Stop by in person to speak with one of our technicians at our office located at 2501 W State Road 84, Fort Lauderdale, FL 33312. You can also call us at (954) 781-1464. Don’t trust others with the important task of servicing your vessels most important component, Call Diesel Services of America. Want to learn more? Find parts for John Deere, Yanmar Marine, MAN, Volvo Penta, Cummins Onan, Perkins, Phasor, and more!